The receiver (#11) cabling comes pre installed incorrectly. The yellow wire needs to be rewired from the middle pin to the next empty spot. The wire is removable by using a very small tweezer to pull upward on the tab that is keeping the wire pinned down. The following diagram describes which wire needs to be rewired. We will begin by creating a new model. A model is the receiver that the transmitter /FrSky Remote controller (#6) is connected to. Therefore a single transmitter can be connected to multiple receivers and thus multiple drones. You can only be connected to 1 drone at a time, however switching between models will allow you to fly other drones. In the Taranis menu on the digital screen of thetransmitter. Press the MENU button and navigate to the next available empty model. Create a model MODELXX (for example MODEL02) by pressing down ENT on an empty spot. Do not use MODEL01 as that is default. Next we bind the receiver (#11) to the transmitter (#6). Using the (+) or (-) buttons, navigate to Receiver no, and then select bind using the enter button. The controller will make a sound. It is now in bind mode. Power the receiver with the bind button pressed. The bind button is located on the receiver itself, it may be covered under a sticker. Look at the image above to locate the bind button. Press Enter button again on bind in the Taranis menu on the transmitter (remote control). Un-power the receiver and power it back on. The light should be green on the receiver for a successful connection, previously it was red. The controller has two level of controls. Physical switches > (INPUT page) >Inputs > (MIXER PAGE) > Outputs. Any physical switch can be assigned to any input through the INPUT page on the controller. The mixer page can mix multiple inputs and assign it to a single outputs. In most cases, when flying autonomously, you will not need to use mixing. Each output will be assigned to a single input. Setup the outputs in the controller. Press MENU button once, then press the PAGE button until you see a page with the title INPUTS. Then use the + and - key to select the channel desired (i.e. 05). Once the channel desired is selected, hold the ENT key. You will see a menu appear. Press the ENT key again to go in the Edit mode. In the edit mode, change the source so it matches this table. Then, set the mixers so the output matches the channels. Reduce the sound output if desired. Setup the fail safe to custom. Then, press set. Throttle should be at -100, and the other channels should be neutral, except for the switches, which should be up. The Raspberry Pi comes with a power adapter to power it, however during flight, the Raspberry Pi would require power from the on-board battery. 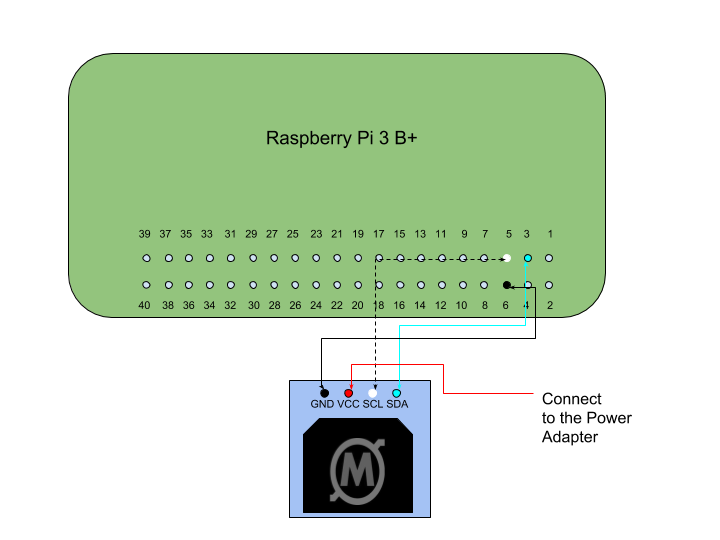 This is done by soldering wires from the +5V and GND on the MRO classic power module BEC [Battery eliminator circuit] (#4) to the 2nd and 6th pin on the Raspberry Pi B+ as seen in the following diagram. Note: Pin layout may differ if using a different Raspberry Pi model. For initial testing you may connect the pixhawk flight controller to the companion computer through microUSB. However during flight, it is prefered to use serial connection as it is far more stable than USB. Use the following diagram to connect the MRO pixhawk flight controller to the Raspberry Pi B+. The Pixhawk should have come with a cable that you may cut and solder jumpwire connectors (#26). Connecting an IIC (I2C) pin OLED/LCD Display is very easy. Take a 4 pin female to female Dupont connector(which has individual 1 pin connector on the other side) or four 1 pin dupont female to female connectors and connect to the the 4 pins on the OLED/LCD Display as depicted below.